If you have teeth missing from your smile, you may understand what it is like to be insecure. Having empty spaces in your smile can result in devastation for the rest of your mouth, and must be taken care of as soon as possible. Although dentures and partials can be one way to solve the issue, but a more permanent solution are dental implants. Dr. Gary Klugman is here to make sure that your smile is restored to its full brilliance with the help of dental implants and his expertise. Dental implants are a very successful dental procedure, as they are very durable and look like your natural teeth! The process begins with a consultation with Dr. Klugman, where he can fully assess your smile in its current condition. If you are the right candidate for dental implants, the process beings with imbedding titanium implants into your jaw bone where your teeth used to be. This implant acts as a new tooth root, and will mesh with your bone. Once proper healing time has passed, the abutment is added, which is essentially a support system for the crown and the implant. When the crown is added, your look is complete, giving you the smile you have always wanted. 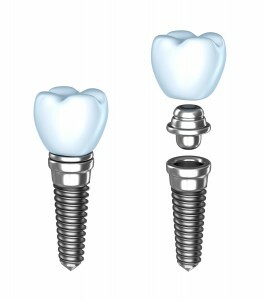 There are many benefits to dental implants, one of them being that they restore your confidence. When you are confident in the way you look, that confidence spreads into many aspects of your life. Another benefit is that your mouth will be in better health, giving you the ability to start fresh! If you have any questions about how Dr. Klugman can help you with your dental implants, call our office, and we will be glad to help!